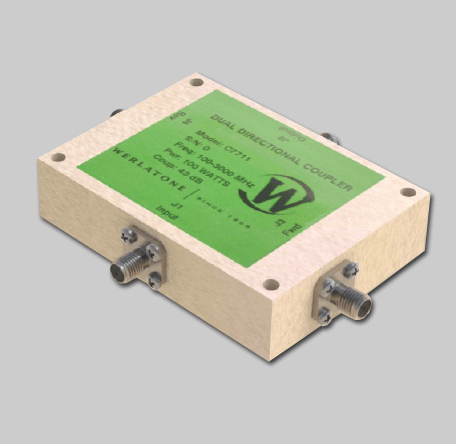 Model C7711 is a 40 dB Dual Directional Coupler which covers the full 100-3000 MHz band and is rated at 100 W CW. The C7711 can be supplied with either N-F or SMA-F connectors, measures just 3.0 x 2.2 x 0.7" and weighs only 8 ounces. Model C7711 is a 40 dB Dual Directional Coupler which covers the full 100-3000 MHz band and is rated at 100 W CW. The C7711 can be supplied with either N-F or SMA-F connectors, measures just 3.0 x 2.2 x 0.7″ and weighs only 8 ounces.